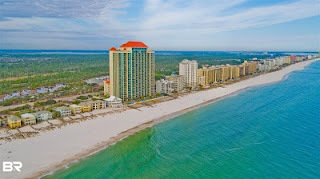 Orange Beach Alabama luxury beachfront condo for sale at Phoenix West. Inviting 3-bedroom, 4-bath condominium on the 14th floor of Phoenix West is ready to make vacation memories to last a lifetime. The condo, with tile throughout, sleeps 12. Fresh Paint throughout condo, new wood-look tile in all bedrooms, new artwork, new furniture and custom drapes. Overlooking the Gulf through floor-to-ceiling glass windows. Master bedroom features a King-size sleigh bed and a flat-screen TV. New tiled flooring in all bedrooms. The large, tiled balcony offers breathtaking views of the Gulf. Amenities include lazy river with corkscrew slide, an outdoor & indoor pool, kiddie pool, hot tubs, a fitness center, outdoor tennis courts, a sauna and a grilling area. This condo is a rental machine without the "worn out", tired look of most rentals. This condo is an investors best deal!.See rental histories. Don’t miss out on this great unit!